In order to make the untrimmed web to the required original width, setting a slitter at the side of the papermaking machine, and we call this slitter is `Machine Trim Slitter`. 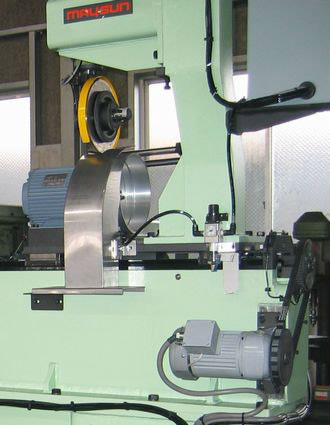 The Machine Trim Slitter is mostly installed between the Calender Machine (Calender is a machine using several rolls to luster of the web) and the wind-reel. The Machine Trim Slitter also has a built-in contact pressure sensor, as same as the other slitter machine of MAYSUN. By the sensor, the contact pressure of the slitter blade will be digitally displayed, and the tool-setting can be adjusted easily, too. Thereby, the steady slit section will be got frequently. The upper and lower blades are installed in the same sliding plates of the Machine Trim Slitter made in MAYSUN. Moving the sliding plates in the transverse direction of the machine, the trim width will be changed easily. Because the Machine Trim Slitter has a compact structure, it can be installed if there is a space of 500 mm in the machine direction. There`re 2 types in the positioning of the slitter unit with manual type and electric type (NC OK.). It`s also possible to add a mechanism to escape the entire Machine Trim Slitter outside as an option. The mechanism makes the operators enter the Calender area easily, and improve efficiency. It`s difficult to process the wide trim width by a slitter machine for winder. So installing the Machine Trim Slitter at the papermaking process, and the trim processing will reduce costs for the entire factory. In addition, the side-run will be caused at the trim processing by the slitter machine for winder, and it takes too much time to dispose of it. On the other hand, if process trim at the papermaking process, the side-run will be not caused. If you change the web width for the purpose of making the original width narrower, the uneven wear will be occurred on the calender roll. By introducing the Machine Trim Slitter, the original width will be changed without changing the web width of papermaking. As a result, it can escape the uneven wear of the calender roll. The high-rigid structure contributes to extremely low out-of-paper rate, and it will also contribute to the speeding up of the machine.